The typical job description for a Clinical Nurse Educator (CNE) includes an extensive list of capabilities and tasks. With such tremendous responsibilities, CNEs are VIPs in healthcare facilities. As such, they must be provided with the tools they need to effectively address their diverse duties, overcome endemic challenges and perform to the best of their abilities. Created to address obstacles faced each day by the busy CNE, the most effective solutions ease these pain points and exponentially drive efficiencies and promote excellence across the healthcare system. Because the CNE has a wide range of responsibilities, they need tools to effectively address the demands of the role and create efficiencies wherever possible. The CNE faces daily challenges such as extreme changes in healthcare regulations, the need to evaluate the evidence that supports clinical practice, and a reduction in resources. It is important that they leverage solutions that help them meet these challenges while cost-effectively ensuring that the clinicians at their organization consistently deliver safe patient care. Ensuring staff competency. The CNE is key in helping to ensure that staff members at all levels are competent in their role and documented as such. However, achieving this goal in an efficient and effective manner depends on the quality of the systems and processes that a hospital has in place. Otherwise, the work at hand becomes arduous and overwhelming. Meeting multiple demands for educational materials. CNEs often are bombarded with a high volume of requests for educational information that may or may not be readily available. In many cases, the requested information requires extensive research to find content that is current, accurate, authoritative, and evidence-based. Resolving conflicting resource information. Information that is made available to nurses and other health- care professionals is likely to have been derived from various sources. CNEs are responsible for ensuring that this information does not conflict with hospital policies and procedures, best practices, and standards, as well as the latest evidence. Addressing unique learning styles. To be effective, a CNE needs to educate based on an individual’s unique learning style and ensure that the information is geared toward his or her level of education and expertise. Developing targeted educational programs and resources can be time-consuming and complicated. Updating policies and procedures. A CNE plays an essential role in helping to keep hospital policies and procedures up to date on an annual basis and as practice, standards, and regulations change. Efficient resources are not always available to ensure that this process goes as smoothly and efficiently as possible. Depending on generic search engines. Unfortunately, CNEs often have to depend on Google and other generic search engines to find needed information. The search results are not vetted in a manner that ensures the delivery of accurate and current information from reliable sources. This effort is further complicated because the CNE must sort through volumes of search results that do not match nursing and medical terminology. Wading through dense on-line resources. Text-heavy, web-based materials hinder the CNE in quickly retrieving information. Conducting offline research. On occasion, CNEs need to go beyond traditional research, that is, calling drug companies or other hospitals or posting queries on association forums to find information. In one scenario reported by a CNE respondent, she said it took her four days to adequately answer questions the pediatric oncology unit had about intravenous (IV) chemotherapy and related skin complications. She used available search tools to try to identify the latest evidence and practice standards but was unable to pinpoint what she needed. And she conducted this research while trying to meet the other daily demands of her role as a CNE. In confidential research conducted by Elsevier, a world-leading provider of nursing and medical information products and services, key information was uncovered about the demands placed upon CNEs’ time and the factors that hamper their overall efficiency and effectiveness. Healthcare organizations are striving to find solutions that will drive efficiency and, ultimately, quality, safe, and cost-effective patient care. CNEs are recognized as being crucial to helping organizations realize this goal. Consequently, organizations are searching for the best reference tools and technology to fuel clinical information flow, meet educational demands and help CNEs overcome their everyday challenges. When evaluating web-based products, healthcare administrators should focus their efforts on a variety of factors during the decision-making process. Having interdisciplinary clinical procedural information available at the point of care is essential to ensuring safe patient care. Decision makers should evaluate the content in such a solution to ensure that it is developed using the most authoritative sources and includes basic and advanced skills and procedures. The solution also should incorporate convenient competency management system functionality to form one single, yet comprehensive, resource for healthcare professionals. The pace of medical innovation and regulatory changes is dizzying, with new information continuously coming to light that could affect clinical decisions. With so much on the line, it is critical for healthcare organizations to have confidence in the informational resources upon which they depend. Among the CNE’s most critical tasks is answering immediate needs for information at the point of care. This requires instant access to trusted and authoritative information to quickly answer pressing clinical questions and bring evidence-based best practices directly to the bedside. To find an appropriate solution, decision makers should evaluate both the technology and the content. The reference solution should integrate powerful search technology to streamline workflow, along with trusted content. Having this solution will help build the confidence of the staff in decision making and the application of knowledge in their practice. Continuing education programs are expensive and can demand a great deal of time. Having online programs available at the healthcare organization offers convenience and helps offset an individual’s expense. Nurses and other healthcare providers are responsible for continuing their education. They can seek continuing education (CE) opportunities at conferences, at seminars, through journals, and through online sources. The CNE plays a major role in developing programs that are offered in house and in supporting nurses and others to participate in off-site CE activities and programs. However, CNEs can provide these activities and programs through an online format. This promotes convenient access for the learner and helps free up the CNE to spend more quality time in the clinical setting. 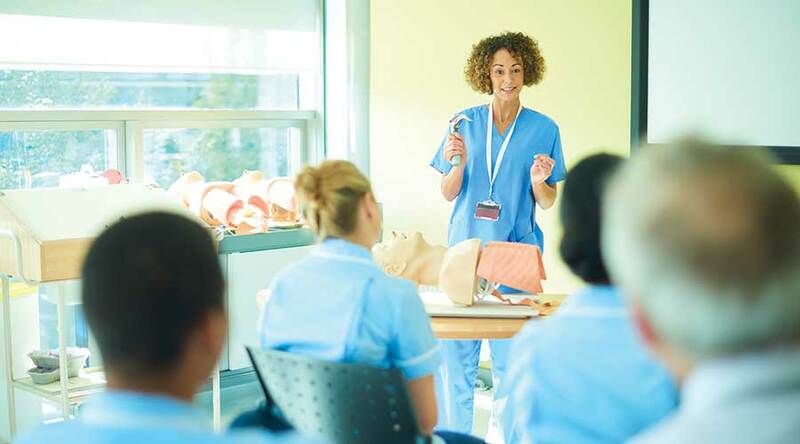 The right eLearning courses delivered the right way at the right time can help promote best practices, ensure optimal patient outcomes, and provide the educational opportunities nurses need to advance in their careers. There is no doubt that the role of the CNE is both critical and complex. However, with the right tools in place, he or she can contribute even more to a facility’s informational and educational needs. With immediate access to authoritative sources and up-to-date content through technology that is built strictly for healthcare, today’s Clinical Nurse Educators can use their time more effectively and work more efficiently for enhanced job performance and satisfaction.